No, you’re definitely not having a moment of deja vu – well, kinda. If these look familiar to you, it’s because I recently posted a recipe for Milky Way Brownie Bites that compelled my dad to call and ask me how I could possibly make such a thing without him being present. Ya see, my pops has a real affinity for candy bars and brownies as a general rule, so combining the two is pretty much his version of dessert nirvana. I went home last weekend, and I knew there was no way I could show up empty handed and live to tell the tale. I whipped up Strawberry Cupcakes and a batch of brownie bites. Instead of using Milky Ways, I decided to use one of my dad’s favorite candy bars – Snickers. In search of brownie points – har har! When I got into town, my dad stopped by my brother’s house for a little taste testing session, but left soon after. I should also mention this is the same day I found this 8 month old loaf of bread in my brother’s pantry. Gross brothers aside, somehow we got our wires crossed. Dad left, Jared went to work. Since they work at the same place, I sent the rest of the Snickers Brownie Bites with Jared, figuring Dad could chow down while he boasted about his brilliant daughter to all his coworkers. I almost can’t bear to tell this story.. Dad neglected to tell me he took the day off work! So off Jared went with his precious Snickers Brownie Bites, and by the time we all realized what was going on, those suckers were history. My poor dad missed out yet again on dessert bliss, with only a few bites to add insult to injury. Guess I have to make them again, right? What candy bar should I use this time? 1. Preheat oven to 350 degrees. Lightly spray the wells of a nonstick miniature muffin tin with nonstick cooking spray such as Pam with Flour, this really helps to ease out the brownie bites. 2. Microwave chocolate and butter in a large, microwave-safe bowl at medium (50% power) for 3-4 minutes or until butter is melted. 3. Stir until chocolate is melted. Whisk in sugar, eggs, vanilla and salt. Gradually add in flour; stir until just combined. 4. Using a small cookie scoop (about 2 teaspoons), scoop the brownie batter into the prepared miniature muffin tin wells. Place a miniature Snickers into the center of each well and press it lightly into the batter. Do not worry about covering the Snickers with batter. Bake brownies in preheated oven for 9-10 minutes, the edges will look set. Do not over bake. 5. Remove to cooling rack to cool completely. Carefully remove the brownie bites from the pan (see note below) and prepare the caramel sauce. 6. To make the caramel sauce, place the caramels and heavy cream in a microwave-safe bowl. Microwave on 50% power in 30-second increments until the caramels begin to melt; stir frequently. Continue warming and stirring the caramels until you have a smooth, creamy mixture. 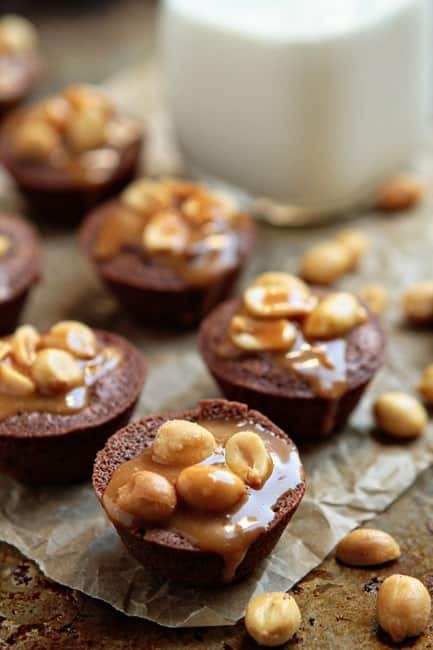 Place a few peanuts into the center of each brownie bite and drizzle the caramel sauce over the peanuts. - Brownie bites are best served they day they are made, but will keep in an airtight container at room temperature for up to 1 day. - I easily coaxed the cooled brownie bites out of the pan using a toothpick. I agree! Twix is the way to go! Twix brownies? They sound awesome. Is it make the same way as these snicker brownies? Your poor dad, bet he was well upset. I would be too! They look soooo good! 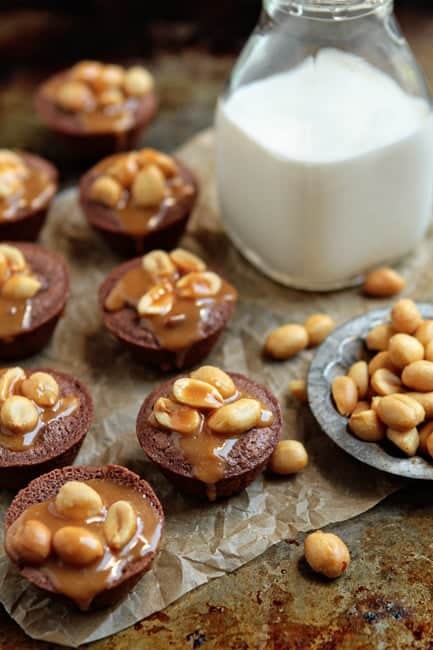 there is everything right with this recipe : mini, chocolate, snickers, caramel sauce —MMMM! Haha – your poor dad! These look delicious, and I can tell why he’d be bummed to miss out on them! Aww, your poor dad :( I guess luck just isn’t on his side right now. I say you make a…Kit Kat version… or maybe a Crunch version. Have you done Butterfingers or 3 Musketeers yet? They look very tempting, definitely going to make them on my son’s next play date. Snickers are one of my favorite candy bars (after Butterfingers). These look divine! Your poor Dad! These and the Milky Way ones look awesome! Next time you could do Twix or 3 Musketeers or maybe a something with Peppermint Patties? So many options…. I make cupcake size ones with mini pb cups. Delish! Your poor dad :( But it never hurts to make more, and these look like I could eat a whole batch myself! They look amazing! Pretty sure I could devour an entire batch of these! The story is too funny! :) Love your candy bars take on brownie bites. Next one: almond joy? Your poor dad! I vote for something with a Take 5 Bar – peanut butter, caramel, pretzels and chocolate – winning combo for sure! Familiar or not, I want the whole batch of these. I am a fool for Snicker’s! Looks really nice and easy! I especially like the topping. Dang, this is puuuure deliciousness! Love that caramel! I just want to say : greatttttttt !!! :( sad… He missed out on one AWESOME dessert! Jamie – i LOVE these little brownie bites! 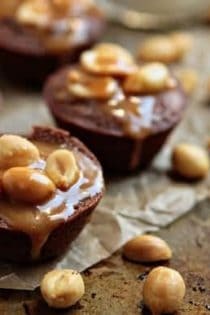 I actually just got a mini brownie pan for my birthday and making these would be perfect for the first recipe – because snickers….. are absolutely my FAVORITE! I just want to dig into that caramel topping! Queenie, Your dad must forget to tell you, that I made them for Jared, and took them to work…and your daddy ate the milky way ones…..lets just said he had enough…..
Yum! I’ve been wanting to make a batch of salted caramel, but I didn’t have any great plans for it (besides eating it from the jar with a spoon)… I will have to make these. My hubby is a huge Snickers fan, so I know he’d love them. I don’t think we have those in the US, but anything with caramel and nuts sounds like a total winner to me. Thanks for stopping by. Oh these look yummy… I’m not sure if this would work as well, but cherry ripe bites? I’m obsessed with cherry ripes but there don’t seem to be too many recipes around for this delicious chocolate bar! Um, just use the Snickers again!! These look so wonderful, better than the actual candy bar for sure! Let me just say that these are incredible! I made them this morning for a staff member’s baby shower and it was almost torturous having them in the corner of the classroom behind my desk all day. Incredibly delicious! OMG! These look sooo good. I want to bake a batch tonight! We are definitely going to give these a try. Awesome pictures too! Thanks for sharing! Aarti, cut each regular sized snickers bar into 4. Then you’ll have about the right size of our mini ones. Oh, wow. Can’t wait to make these delicious-looking bites of goodness. Thanks for sharing the great recipe. I hope you get the chance to try them. Thanks for stopping by. These look great! I was wondering how many they would yield in a regular muffin tin, and how much longer I’d have to bake them for. I have never tried this using regular size muffin tins, so I honestly have no idea about this substitution. Sorry I am not more of a help.